Well another month has rolled up and I figure it is time I give my verdict on the tipping service offered by the BetAlchemist. From the last posting on 8th March, there have been 41 selections resulting in a profit of 4.6 pts. So the bank stands in profit to the tune of a mere 2.8 pts! Not quite what I was expecting to be truthful. To be fair to this service, we do seem to have had a poor run during this review – with average monthly results, from the two previous years, showing profits generally in the ‘tens’ of points .But of course, that’s just the way these reviews go sometimes. Despite this, I will reiterate the very impressive results this service achieved over the Cheltenham festival period which amounted to 71.5 points over the 4 day period! Your first month is charged at a discounted rate of £15 (+VAT) – subsequent months subscriptions at £30 (+VAT) . For this you get access to the website and a regular email update from Nicky to advise of the latest selections posted on the BetAlchemist website. The sign-up deal also includes a 60 day money-back guarantee / your payment is submitted via Clickbank. They also offer a discounted quarterly subscription rate of £79 (+VAT) which obviously represents even better value. Once signed up, simply log in , take the selections to your BOG bookmaker and place your bets. Overall, if you are bettor who is prepared to take a more relaxed stance in your day to day betting activities then perhaps BetAlchemist is the product for you. Given the meagre return over the course of the last three months, I would normally have offered a Neutral rating but assuming the historical results I have seen are legit, and I have no reason to doubt that they are otherwise, I feel confident this is merely a seasonal ‘blip’ in proceedings. On balance though, I am going to suggest that this service is given an APPROVED rating on the merits of its’ results achieved during the Cheltenham festival, which I am sure you will agree, are astonishing! We tested and approved this service earlier this year but I thought it was time for an update on how it’s been performing since our review. The summer bounced along breaking even for much of it but since September it’s really hit a purple patch, returning over 50 points profit in the last six weeks alone. They have a great record of picking winners over the National Hunt Season which has just kicked in and I know they will have a few value selections in the Cheltenham Showcase meeting this weekend, plus their main attention will be on Champions Day at Ascot which is the final highlight of the flat season in the UK for 2013. The service continues throughout the Winter with bets in all the top flat and NH races like the Breeders Cup, Cheltenham Open Meeting, Betfair Chase, Punchestown, Navan, Kempton, Ascot etc etc. Full results are available on their website detailing the massive 148.2 points profit since the service went live in December last year… just ten months! We last did an update on this service in November 2013 so it’s time to see how it’s been performing since then. 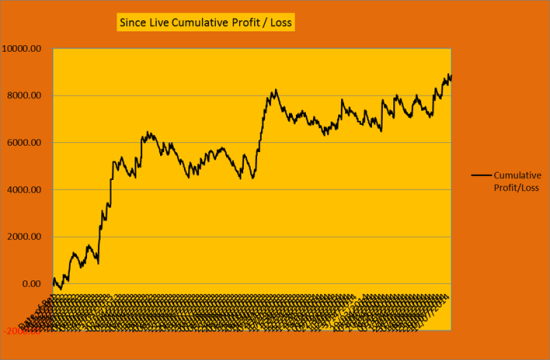 First of all, 2013 ended with 116.49 points profit, with six profitable months and six losing months. The total profit since the service went live in Decemeber 2012 now stands at 178.47 points, with 1007 bets, 174 winners and a strike rate of 17.28%. There has only been one losing month so far this year, but last year still managed 116 points with six losing months! The return on investment is running at 15.58% and the strike rate of 17.19% (almost 1 winner in 5) is very good too considering this is a value price backing service seldom betting the first two in the market.